This time, I wanted to be able to do more sitting and talking than mucking about with pots and pans. I don’t want my guests to be speaking to my back as I stir something on the stove and I just didn’t feel like making a second meal for the kids. I hate doing that, actually, but end up there more than I like to admit. So this recipe — which I adapted from others I have done or read — was perfect. Just bung everything into a pot and a half hour later you have tasty, crowd-pleasing goodness that you can pile onto other Mexican-infused ingredients. 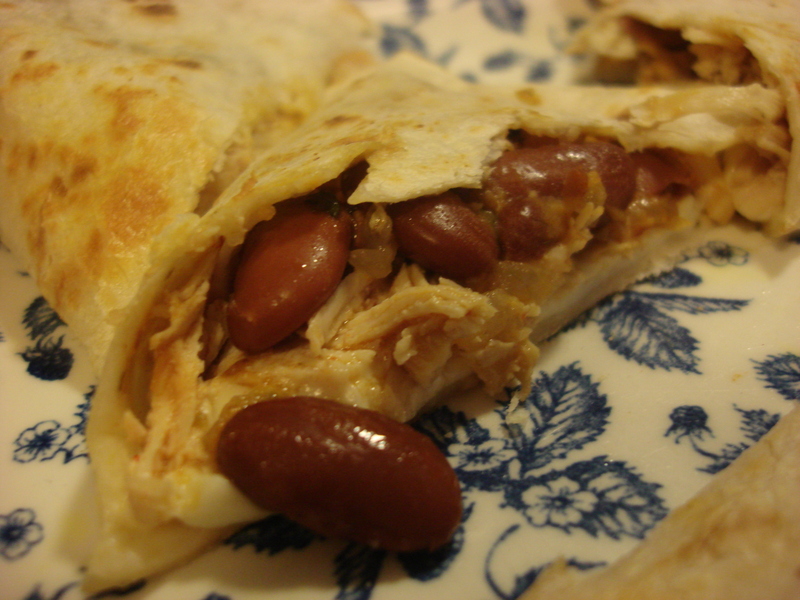 On this occasion I made quick quesadillas with red beans (another one pot dish, see below) and Cheddar and Dominican white cheese which Leandro, Amanda and I ate, accompanied with avocado, cilantro and red onion. The revelation was Lucas, a bit more of a picky eater, who tasted the quesadilla (both the all-cheese just-in-case one and a chicken one) which by itself would’ve been cool, but who ended up loving the chicken on its own and eating several servings! And yes, I sat – we all sat down to dinner together, in fact — and I didn’t fuss! Hurray! Place all ingredients in a large pot. Bring to a boil. Lower heat to medium-low and simmer for at least 20 minutes until chicken is thoroughly cooked. If you have time, you can cook it longer for more tenderness. Remove from heat and remove chicken from any remaining liquid. Allow to cool, shred, and serve – hot or cold — in your favorite Mexican-style recipes (quesadillas, tacos, with rice, on salads). 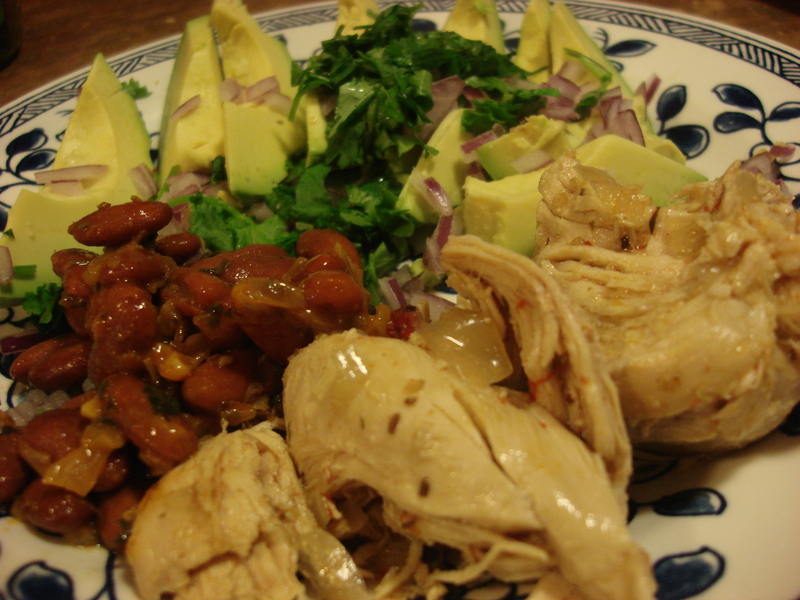 Flavor affinities include avocado, lime, cilantro, kidney beans. Saute onion in olive oil until tender. Add the rest of the ingredients and cook for 15 minutes until flavors are incorporated. Stumbled across this because Adriana pulled it up at work the other day and threw this together the other night with some alterations here and there. Great recipe! That is a terrific idea, Stephanie, thanks! I thought about trying that, but it was the wrong moment. I also worried about too much salt; was it very salty? Did you know Adriana was the one who introduced me to chipotle in adobo? Love you and your cooking!!! Thanks for making me your guinnea pig!!! Looks so tender. I love shredding chicken. Great recipe. This is making me hungry. I might have to do this this week… Great weekday idea!